All the customer orders and sales can be recorded and printed using Eagleowl POS application. This helps restaurants to manage sales record and to remain well organized. 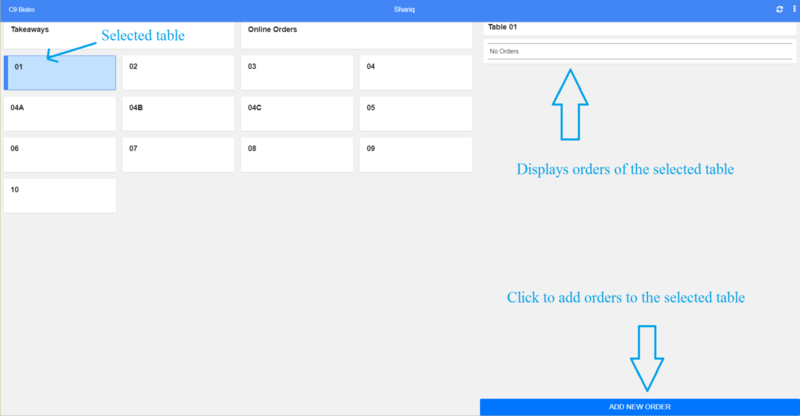 Restaurant&apos;s table layout is displayed in the POS application, it also includes Takeaways and Online Orders . As shown above, you have to select order type(Table/Takeaway/Online) and then enter the order. The selected table is displayed with blue border. Orders are placed in orders page. A display of complete Menu is displayed on the left side of the application where you can select the category to view the respective items tagged under the selected category. As shown in above example, the items under Mains category are listed. In a similar way you can filter all the items of a particular category. Click on the items to enter the order and then you can apply the discounts, NCs and GST based on the requirements. You can search for the items in the search tab to speed up the entry. Click on Discard to delete the order before placing the same. Click Place Order so the order is processed and in parallel KOT is generated by the system. KOT is prepared to intimate the food order of the customer to the kitchen staff. It helps in serving the right order to the right person. The KOT consists of details such as table number, order number, date, time, items ordered and its quantity. Usually, all the KOTs are serially numbered for control and management purpose. The generation of KOTs can be seen on the left side of the application. As shown below, the serial number of KOT, assigned printer, items ordered, and its quantity are displayed. As shown above, "local" printer is configured to print KOT. Click here for more details on printer configuration. Consider, the above order is updated i.e., a "Brownie Bites" is added up. Separate KOT will be generated as shown in below example. Orders of respective tables will be displayed on the right side of the application as shown below. 1. VIEW: Click on View to view the order. 2. MOVE: In some cases, customers at one table will be moved to another table based on their demands or requests, also their might cases where the orders of one table has to moved to another table, or the order was placed online but entered wrong, or in case if a customer wants to takeaway his/her order which was placed as a table order. To avoid these confusion in orders, Eagleowl provides a way to move the orders. Consider, "Table 1" has 2 orders placed and one order has to be moved to "Table 4". Click on Move and select "4" from the dropdown. Now, you can see the "order 12" is moved to "Table 4" from "Table 1"
The green border indicates that the "order is in process"
3. CANCEL: Click on Cancel to cancel the order. Click on Settle to make the payment for the placed orders. NOTE: Orders can also be settled in orders page. Once you click settle you&apos;ll be directed to order settlement page. Select the Payment method from the dropdown and enter total amount paid. Click Print to print the bill and Settle for settlement. You can also enter customer details for future reference. Eagleowl provides a way to split the bills. For example, you can split the bill in two as shown in below example. Now, the pending amount is 52/- and is paid separately. Later, click on + to pay the pending amount. Now you can settle your payment. Pending orders are the orders which are not executed and settled. Once the order is received and processed completely, customer may get into some issues in paying and he/she might request to pay the amount later. In this situation, you can save the order as pending and get the contact details of customer for safer side. As shown in above example, 100 rupees is yet to be paid by the customer. Avoid taking pending orders so that you are saved from further losses.